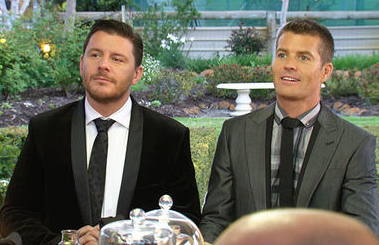 My Kitchen Rules was the only game in town on Thursday night, once again way out in front of the competition with 1.86m viewers. It was the only entertainment show to crack the magic million, and by a country mile. Seven network shares were 34.4% then Nine 26.1%, ABC 17.5%, TEN 16.4% and SBS 5.6%. Seven’s other shows were Seven News (1.06m), Today Tonight (933,000), Home and Away (908,000), Bones (851,000) and Deal or No Deal (428,000). Nine News was 1.12m then The Block (980,000), ACA (889,000), Hot Seat (584,000), The Mentalist (578,000) and Hot Property (564,000). Footy Classified was 321,000 in 3 states. ABC News (878,000) topped ABC1 then 7:30 (656,000), Catalyst (618,000), Making Couples Happy (497,000), The Midwives (378,000), and Grand Designs (271,000). TEN News was best for TEN with 578,000. Law and Order: SVU was 419,000, The Project was 414,000, American Idol was 392,000 and The Simpsons was 286,000. Jerusalem on a Plate (255,000) was best for SBS ONE followed by Food Safari (221,000), 24 Hours in Emergency (210,000) and Island Feast with Peter Kuruvita (175,000). Big Bang Theory was best on multichannels with 271,000. I bet Channel 7 will go close to topping the 3 million mark for the episode of MKR in which the two Asian girls cook. The whole Asian girls vs the Italian Mamas last night, contrived or not, was hilarious. The episode next week with Sophia and Ashlee doing the cooking will rate over 2.5M, I’m sure of it. It will go through the roof that night, which I think will be next Wednesday. The momentum for MKR this year is extraordinary, reminds me of the dominance of The Voice last year. The Block has not really gained a lot of traction this year, it is getting lost in the backwash of MKR, much like Excess Baggage did this time last year, though it is rating better than EB, but it is certainly not the hit Nine would have wished for. Get rid of US Idol – move it to 11. The experiment hasnt worked. Surely Simpsons repeats would rate better?! Eleven is going to be so jam packed with new product – American Idol and Glee to name but two. Their numbers indicate they cannot stay where they are.